There are several things that can disrupt a hydraulic system and lead to pump failures. Any hydraulic system will generate heat, regardless of how it is designed, so making sure the heat is properly handled within the hydraulic system is very important. This must be done to make sure the oil temperature doesn’t reach a point where it will cause damage to seals or valves. One key way to make sure there is no excess heat buildup is to use a lubricant reservoir that is of the proper size. A tank that is too small for a hydraulic system can easily overheat and create problems. Contamination from oil that doesn’t meet the right standard for cleanliness, due to poor filtering, can create two major problems. It can damage the pump and also result in blockages in the hydraulic system. This means it’s vital to ensure the hydraulic system has an effective filtration system to cleanse the oil of any problem-generating contaminants. So filters must be changed regularly to keep the fluids clean and the system operating smoothly. Cavitation can occur when there is a lack of oil moving through the inlet line from the reservoir tank to the inlet port of the hydraulic system’s pump. Worn internal components, loose fittings, worn seals and blocked filters are all common causes for cavitation. Cavitation reduces the lubrication efficiencies of the oil and will cause metal erosion or fatigue, damaging the pump and contaminating the fluid, leading to premature failure of other system components. One way to check for cavitation is to look for any foamy oil moving through the system, easiest found in the reservoir. If foam is present, there is likely a cavitation problem in the hydraulic system. 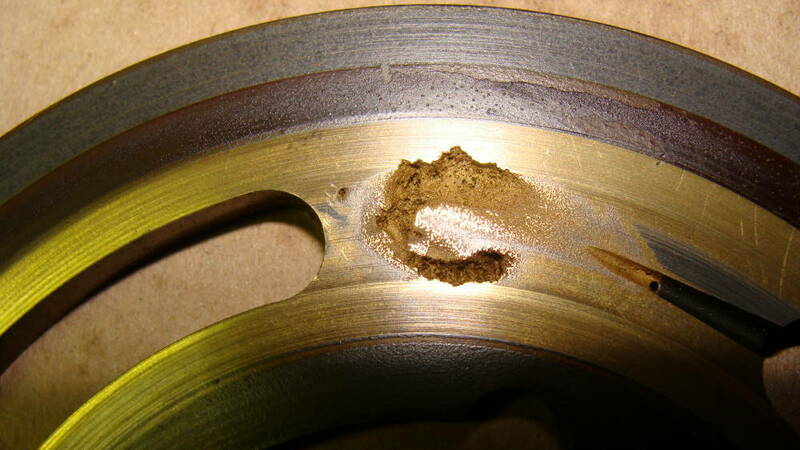 Another sign of cavitation is a loud banging or knocking sound under load or at high rpm. How can cavitation be prevented, or dealt with if it is occurring? If the equipment is experiencing cavitation and has been in service for hundreds of hours or more, we can assume that it is not a design issue. Inspection of the system for oil leaks, pinched or kinked inlet hoses, and examining pump and motor temperatures are the first places to look. Remove and inspect hydraulic filters to insure oil flow or have Rush Hydraulics perform a full system flow test. If the cavitation is on a new system build, one thing to consider would be to increase the size of the inlet line, which leads from the reservoir tank to the pump. Another way may be to reduce the flow in the hydraulic system. Consider straightening out the inlet line by removing as many bends and elbows as possible. Finally, getting rid of any filters placed on the inlet line. Remember: it’s important to ensure the reservoir tank holding the lubricant oil is positioned above the pump. Aeration, like cavitation, is what happens when air enters the lubricant, creating foamy lubricant fluid, as well as erratic actuator movement. Like cavitation, it can even result in abnormal banging or knocking noises from the fluid as it compresses and decompresses. It speeds up the degradation of the lubricant fluid and can lead to hydraulic system failure that damages components. Aeration normally gets into the system through the inlet line leading to the pump. Inlet lines can become porous as they get older, while air can also enter into the system through clamps and fittings that are not tightened appropriately.